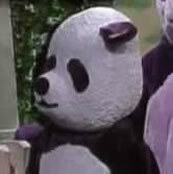 Little Panda is a resident of Planet Purple and looks much like Purple Panda -- only smaller. Together, they play a trick on King Friday by convincing him that Purple Panda has shrunk. Like Purple Panda, Little Panda only speaks in monotone. While traveling the "purple way," he and Prince Tuesday accidentally ping to A.O.P (Altogether Other Planet) and have to be rescued by Hula Mouse.